let's make all movies 3D! even old favorites that made you cry when you were 7and didn't understand how one lion could be so terrible to all the other lions, including his own family! remind me why it wasn't good enough without special glasses? are hyenas going to leap out at me? are antelope going to stampede into the audience? i can't handle the anxiety! 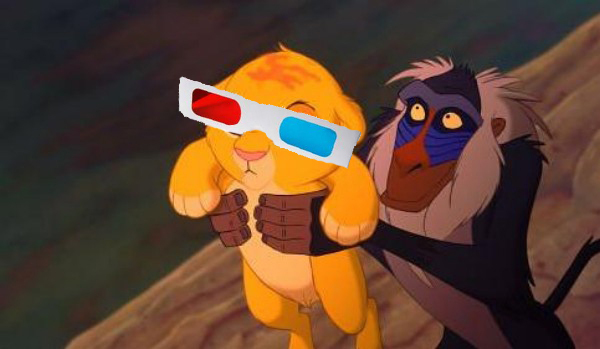 what's the big deal with 3D movies? I've seen a few simply because I accidently bought the 3d ticket or because that was the only showtime. For example, Gnomeo and Juliet, and Rio (I think those are the only ones). I don't think i even noticed any 3d-ness--at least not enough to pay extra for and have to wear some annoying glasses. I think it's lame and a fad but there must be enough people who do like it cause it is really taking off. I've seen a couple. They always make me feel nauseated. :( BOO ON 3D! I hope you were referring to the unfortunate bladder mishaps when you said you do it more often than is appropriate. And I've only seen Avatar in 3D, but I thought it was kinda cool. But for other movies, such as the Lion King, totally not worth the extra five bucks or whatever it is. Yeah, I think 3D is super lame. Some movies may need it just as a gimmick to draw an audience (although personally, I'm more likely to be repelled by a 3D label), but Lion King could have gone back into theatres without it and still have been a success. Hello! It's got Mufasa. oh my gosh - that reference is driving me nuts. I can see the little kid freaking out. High pitched voice all panicked like "They're trying to kill it!" I will figure it out. don't you worry. I *hate* the 3D! It always makes me feel sick! Unless it's just a shorty one, like a Disneyland attraction, ya know? But when I saw Alice in 3D I had to take breaks and close my eyes! 3D movies give me a headache. Also, I know where that quote is from, but only cuz I googled it, which I think negates the cool points, although the clip I found on youtube did give me a laugh. Not a fan of 3D. That said, I will probably still see Star Wars in 3D when they release it next year or whenever it is. I'm not sure what the big deal is either. 3D movies give me headaches so I'm not a fan at all! Oh, and I fall asleep during almost every movie so I'm not paying extra money to fall asleep and/or get a headache.